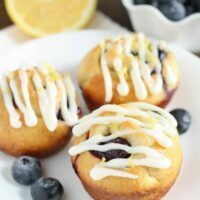 These Lemon Blueberry Sweet Rolls are easy to make and perfect for a quick breakfast or dessert. Hey there everyone, it’s Danielle from Live Well, Bake Often! I’m so happy to be back sharing this delicious recipe with you all while Amber is on maternity leave. I really love this time of year because berries are in season and I love adding them to recipes when I can. So, I decided to combine one of my favorite berries with lemon for you all today! 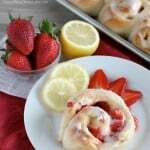 If you love the combination of lemons and berries, then I can guarantee that you will love these sweet rolls too. 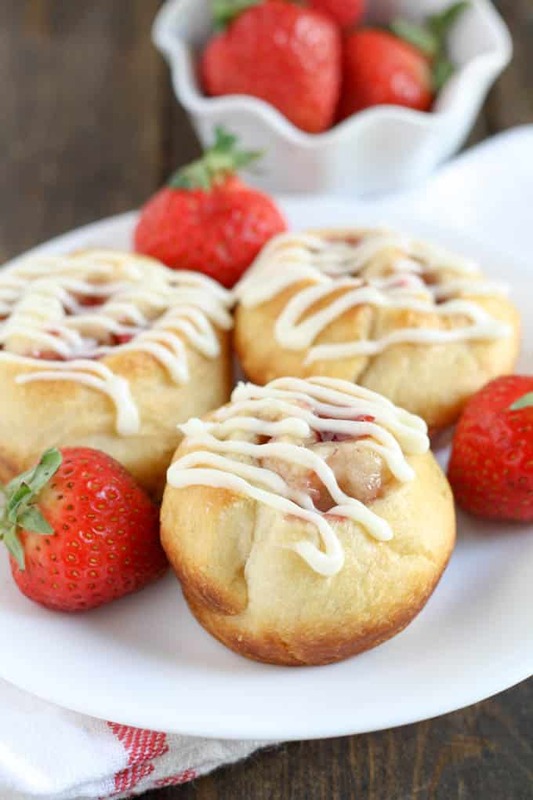 To make these sweet rolls a little easier, we’re using a shortcut by using crescent roll dough. I told you these were easy, right? Just unroll the dough and pinch the seams together, add the filling, roll it up, then cut it into pieces and bake them! I find the easiest way to cut these is with unwaxed and unflavored dental floss, but a sharp knife will also work too. I prefer to bake these in a regular sized muffin pan as well, since it helps the rolls hold their shape much better. 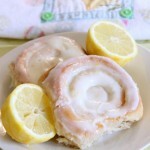 I topped these sweet rolls with a delicious and easy lemon cream cheese frosting. I always set the cream cheese and butter I need out before I start the sweet rolls, that way they’re nice and soft and ready to be mixed once you take the rolls out of the oven. So if you’re looking for a quick and easy breakfast or dessert, then definitely give these a try. I guarantee everyone will love them! To make the sweet rolls:Preheat oven to 375 degrees Fahrenheit. Spray 8 cavities in a muffin pan well with non-stick cooking spray and set aside. On a clean surface, unroll the crescent roll dough into a rectangle (if not using seamless, make sure to press the seams together). Spread the Tablespoon of softened butter evenly over the dough, then sprinkle the sugar and lemon zest over the dough. Evenly distribute the blueberries on top. Starting with the long side, tightly roll the dough up. Using unwaxed, unflavored dental floss or a sharp knife, cut the roll into 8 equal pieces. Place each piece into the prepared muffin cavities. Bake at 375 degrees Fahrenheit for 12 to 15 minutes or until lightly golden brown. Remove from the oven and allow to cool in the pan for about 10 minutes. To make the frosting:Using a handheld mixer, beat the cream cheese and butter until smooth. Add in the powdered sugar and mix well, then add in the lemon juice and mix until fully combined. Evenly distribute the frosting between all 8 rolls. 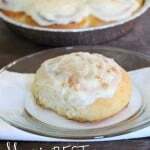 If you love these sweet rolls, then you might also enjoy these recipes! These look amazing! 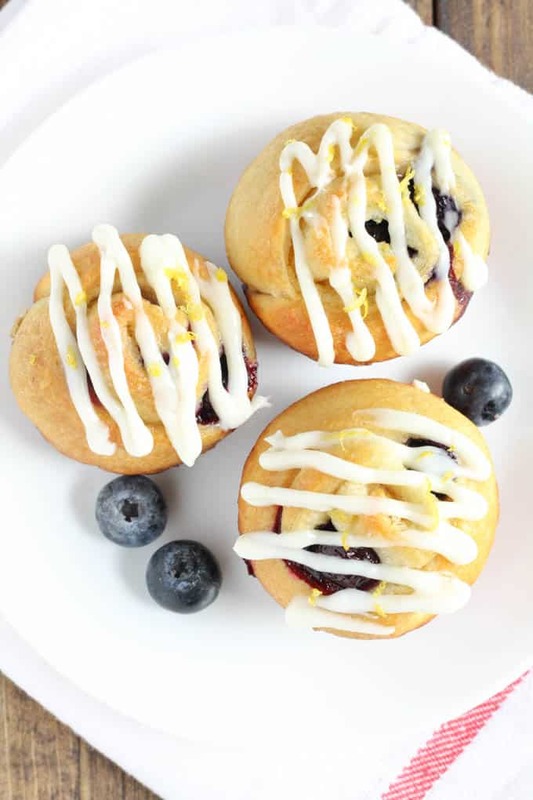 I love lemon and blueberry together, and I love pastries that don’t require me to make the dough! 🙂 Thanks for sharing! These look so pretty and perfect for this time of year!! 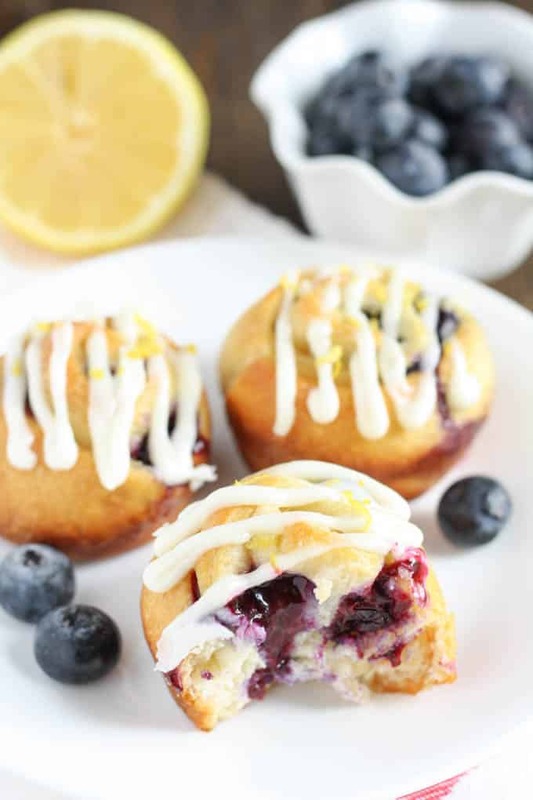 Lemon and blueberry make a perfect combination!! 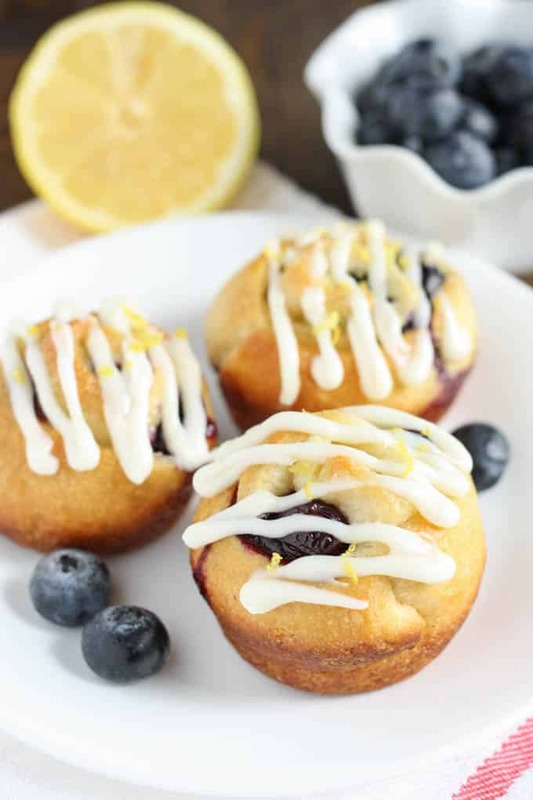 Blueberry and lemon is my favorite summer combo! 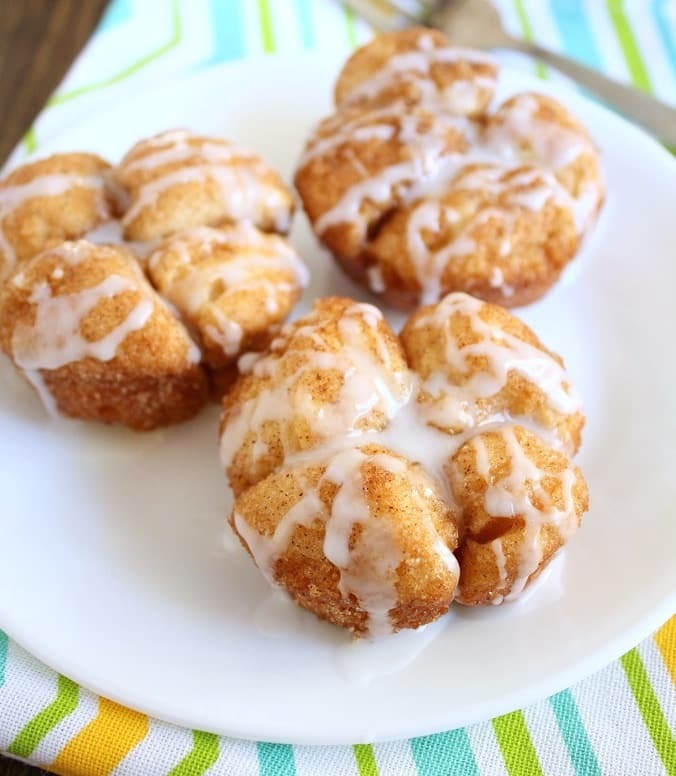 Love these adorable sweet rolls, Danielle! They look like the perfect easy and delicious breakfast! Thanks, Kelly! 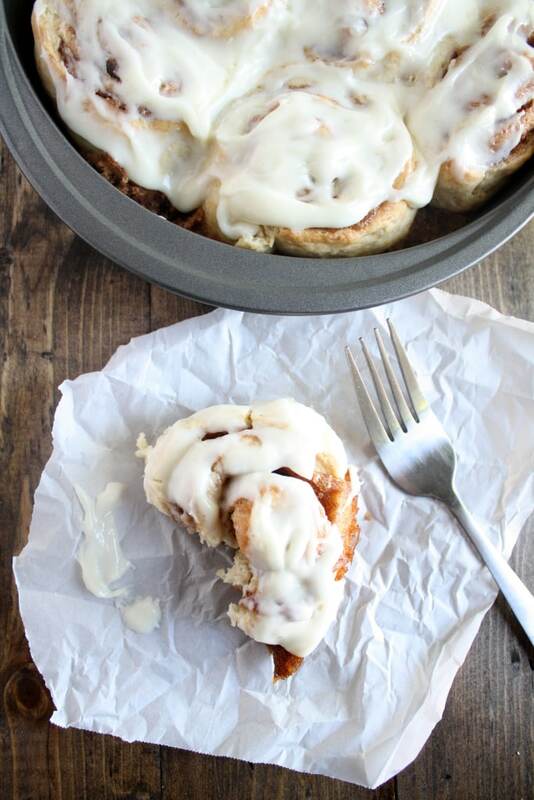 They’re definitely perfect for breakfast!